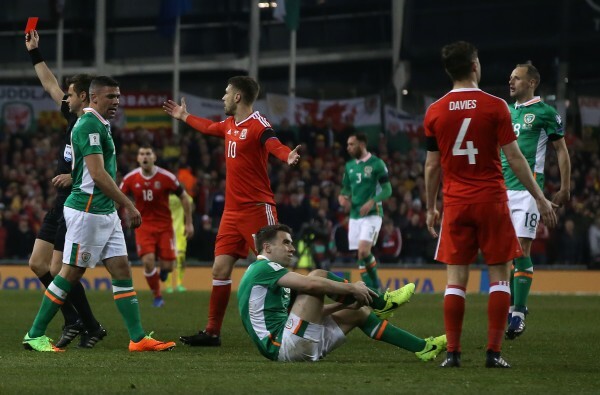 Ireland captain Seamus Coleman’s horrific leg break was sadly the biggest headline from their 0-0 draw against Wales in their heated World Cup qualifier. The game was a physical contest and unfortunately for the Everton full-back, 28, a double fracture to his right leg resulted from the melee. The nightmarish injury was not repeated by broadcasters due to its gruesome nature and saw Coleman taken off on a stretcher and given oxygen. It could well see the Irishman stuck on the sidelines for six months or more and he is due to undergo surgery on it today. 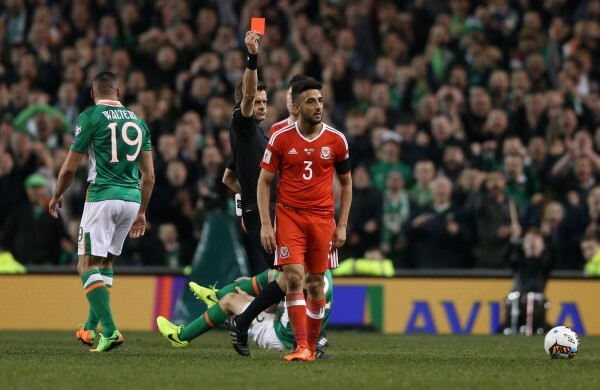 Coleman’s injury was sustained after a bad tackle from Neil Taylor – a challenge which led to the 28-year-old being sent off 69 minutes into the game. According to his Wales teammate Joe Allen, 27, Taylor is “in bits” after the incident and Allen said there was “no malice” in the challenge. Tributes have been pouring in for Coleman, with Everton teammate Leon Osman writing on the club’s website: “I’m absolutely gutted for him. I wish him all the best and a speedy recovery. Many took to Twitter to share their condolences. The incident was so shocking, even rival clubs have been paying Coleman their respects. Joe Ledley, who played for Wales last night, did the same. As did players from across the Premier League. And many, like Osman, believe Coleman has the character to return stronger than before though.